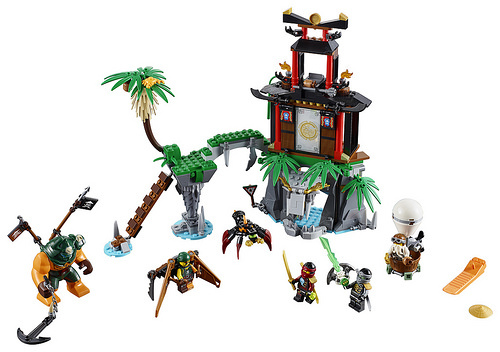 In advance of our coverage from New York Toy Fair this coming weekend, LEGO has provided us with some details missing from previous coverage of the 2016 Ninjago line, including full product descriptions, higher-res images, and confirmation of a March release date. When LEGO had sets like 70605 Misfortune’s Keep and 70603 Raid Zeppelin available in mid-December to send us for review, we were actually expecting a January release, but January has come and gone somewhat to our confusion, so it’s good to finally have confirmation of the real street date. Final product descriptions follow each image below, but be sure to click through to Flickr and check out the first full-res images of the 2016 Ninjago sets. Mighty Dogshank is approaching carrying her huge anchor weapon. Fight back with Nya’s katana and drop coconuts on Dogshank from the tower and Sensei Wu’s hot air balloon. Watch out for Sqiffy’s pirate flyer and make the palm tree fall to knock him off the ladder. Hide out in the cave — and beware of the giant venomous spider roaming the island! Defeat the pirate invaders and free trapped Lloyd from the special Djinn Blade! Jump into the dragon’s saddle and grab the reins. Snap the jaws and adjust the head, wings, legs and tail for awesome battle poses. Dodge Cyren’s harpoon hook shooter and the pirate flyer’s six-shooting rapid shooter. Fire the spring-loaded shooters to take down the flyer and then release Nya from the Djinn Blade! Swerve clear of the Zeppelin’s powerful cannons and dynamite dropped through the trap door. Fire the flyer’s elemental ice stud shooters and board the airship. Face-off against the Doubloon and Clancee to grab the Djinn Blade and free your fellow ninja warrior Jay! Pose the neck, wings and legs of the dragon and fly into attack. Defeat the sky pirate and free trapped Zane from the special Djinn Blade! 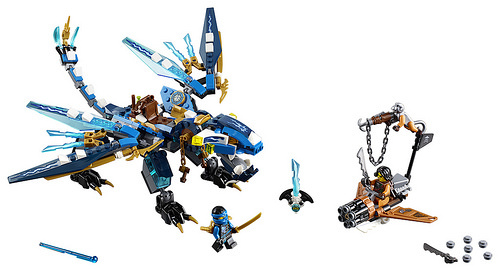 The evil Djinn Nadakhan and the crew of Misfortune’s Keep are threatening to destroy Ninjago. Soar sky-high with Lloyd’s booster jet and operate the winch to lower Jay into battle. Beware of Misfortune’s Keep’s hidden cannons, disc shooters and the pirate jet taking off from the launchpad. Can you help the Ninja to defeat Nadakhan and free trapped Wu from the golden Djinn Blade? Target the sky pirate’s flyer with Kai’s bike’s hidden cannons/boosters. Dodge the flyer’s bombs and aim the elemental water cannon from Nya’s awesome bike. Take his flyer down then fold out Kai’s bike’s golden Ninja blades to attack. You must defeat Sqiffy and free Cole from the Djinn Blade! 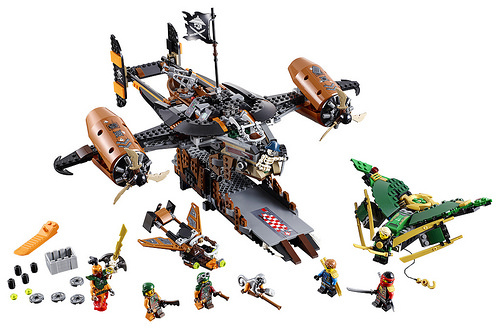 Send up the drone to check out this awesome jet with dangerous blades, guns and loads of cool pirate details. And beware—the Sky Shark could drop dynamite or rotten fish at any moment! Then convert the drone into a jetpack for Lloyd and launch the Ninja hero into battle. Bring down the Sky Shark and fight to free trapped Kai from the Djinn Blade! We’ll have complete coverage of all the LEGO themes on Saturday, so be sure to check back regularly over the weekend! Excellent! It’s interesting to see when sets come out for different markets. We’ve been keeping an eye out for these, since we thought they were great when we reviewed them, but just haven’t seen them. Have you picked up any yet? It’s been a long time since I’ve been this excited about a non-licenced Lego line. These details really cement my interest as well. Thanks Andrew. Not the most revealing press release we could get, since the sets (as well as descriptions and high-resolution images of them) are already available on shop.LEGO.com for many countries. But as a Ninjago fan I appreciate that LEGO is trying to build hype for their US release! I wish they could have also included a premiere date for season 6 of the TV series on Cartoon Network! There’s a lot to be excited about in these sets. Besides the general awesomeness of a ragtag crew of sky pirates led by an evil djinn, we also get awesome new costumes for the ninja, our first female bigfig, a new monkey mold, a fantastic and creative build for a palm tree (among other great landscaping details), an amazing new dragon for Jay, a ghost version of Cole, and possibly the best enemy flagship the theme has had. 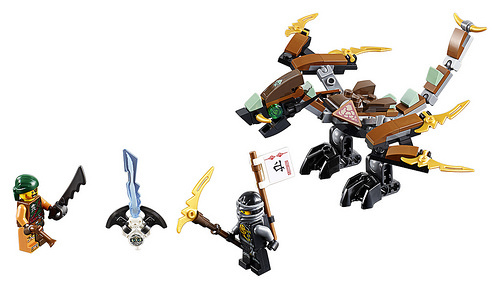 The only sets that strike me as underwhelming are Cole’s Dragon and the Ninja Bike Chase. Even then, Cole’s Dragon is not a bad set for its size. I just wish the size difference between it and Jay’s Elemental Dragon weren’t so great, and that it came with the ghost version of Cole who appears in Tiger Widow Island. I also wish Raid Zeppelin had more functions, but it’s still a great set by virtue of its uniqueness. One of the interesting and surprising things we learned at Nuremberg Toy Fair is that there will be at least three new “Skybound” sets in the summer, alongside the sets for the Season 7 story arc. 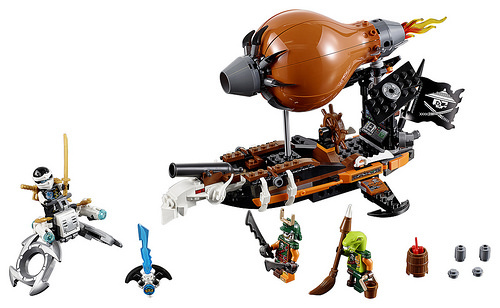 This is the first time LEGO has released sets for two separate seasons at the same time. I look forward to getting more pics of those three sets at New York Toy Fair! Overall, very excited for what Ninjago has to offer this year!